BIBLE LITERACY & EDUCATION: Sponsor a student at the Three Angels. This is a great option for programs focused on learning the bible, education and connecting with children ‘just like me’. There are no ‘free’ public schools in Haiti. With less than half of the population able to read, Christian education is a powerful way to break the cycle of poverty and experience God's love. By sponsoring a student or classroom, your kids can help provide a safe place to learn and grow, receive healthy meals, bible instruction, medical care and much more! Connect to a specific student and our school with videos, photos and profile information that can be shared with each child or class. Videos and info can be found HERE. We encourage your kids to write letters to, and draw pictures for, their sponsored child! CARE FOR THE ORPHAN: Sponsor the care of a child at Angel House Orphanage. For groups focused on putting faith into action (James 1:27 or Isaiah 1:17). An engaging way to run a fundraiser is for children to collect change in baby bottles! At Three Angels, we do ‘Orphan Care’ differently. We are intent on keeping families together when possible and creating families when needed. We only admit children who are legally deemed orphans; they have no other family option in Haiti. While at Angel House, children receive the highest standard of care possible. By sponsoring a child, your kids help provide a loving home! We will provide shareable photos, videos and profile information of a specific child at Angel House. 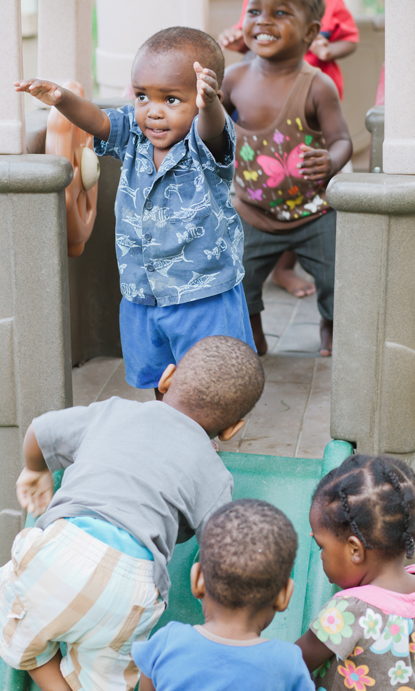 Learn more about our orphanage program HERE. Children can put together a ‘gift basket’ for the kiddos at Angel House from a list of specific needed items. CLEAN WATER SAVES LIVES: Help raise money for clean water for the children of Haiti. The Bible and water are very much connected. Water is mentioned 722 times in the scriptures! Teach children to share living water, both figuratively and literally, by helping fund clean water at the school, orphanage and medical clinic in Haiti. Close to 70 percent of people in Haiti do not have direct access to potable water. (Center for Human Rights, et al) Waterborne illness causes more than half of all deaths in Haiti each year. Cholera, typhoid and chronic diarrhea are extremely preventable by simply having access to a clean, fresh source of water. At Three Angels, we provide clean water for over 400 people every single day. Through our Medical Clinic, we also teach community classes on everything from proper hand-washing and hygiene to waterborne diseases. Three Angels can provide shareable photos and videos of the children who will be receiving water. We can provide stickers that can be affixed to standard sized water bottles. You can then use these for either drinking water for the participants or for coin collection. $2 can provide one of our students, orphans, patients or staff member with clean water for the entire month. That is around 7 cents a day to make a significant impact on the health of a child in Haiti!